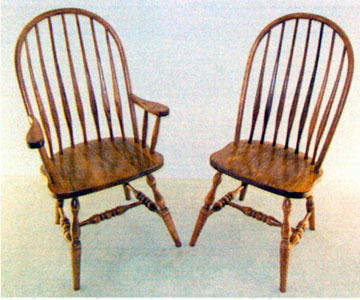 These Amish made 7 spindle bow back chairs are available as arm chairs or side chairs (no arms), and are available with either plain or fancy legs (fancy shown). The Amish can build these sturdy chairs out of solid oak, cherry, maple, hickory or walnut depending on the availability of the woods, and they can be finished in a variety of stain colors. Please ask for price if you want maple, hickory or walnut.